I have photographed fascinating people, their arts, and environments in 27 countries, focusing on Southeast Asia and Oceania, the Americas, and Europe. I first picked up a 35mm camera in 1968 to document protests at the Chicago Democratic Convention. As my interest in photography grew after college, I photographed weddings, theater productions, news and sports, eventually landing a job as a photographer and reporter in Washington State. Several years later, I became a photographer and graphic artist for a chain of African-American newspapers in California and first published a photograph in a national magazine. My passion for civil liberties, human rights, reproductive freedom, and the environment led to a career as a fundraising and strategic planning consultant. 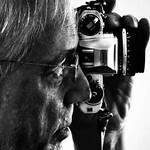 Now, living in New York City and Longboat Key, Florida, I have returned to photography with renewed energy. My approach. All photographs have the same defect – they are incomplete. There is so much to see and so much we do not see. My choices of what and how to photograph or include in the frame, or not, are highly personal. Foremost in my mind is the desire to capture striking, hopefully original, images that are also honest to my subject. For me, taking photographs is a way of seeing -- forcing myself to look at people, structures, and nature from many angles -- up close and far away, with the sun in front or behind, with details in the full light or depressed, or to see a scene change balance and composition as I move to different vantage points. What often catches my eye and imagination are patterns of light, shadows, panels of color, or objects in the photograph. Many of my photographs may look documentary, but they are not. I want to present images that evoke strong feelings in me, and hopefully others, and I freely manipulate the images – to enhance, depress, or even change colors, to lighten or darken some areas, to crop tightly, to remove distracting elements, to sharpen some areas and to soften detail in others.